I was speaking with someone yesterday, talking about how quick some people are to make themselves powerless. My health, is out of my hands. My relational circumstance, is out of my hands. My financial circumstance, is out of my hands…blah, blah, blah. And it resonated within me as a precise truth. Are we willing to take full responsibility for every circumstance that presents itself to us in our lives? So often people accept the false belief that it simply “is out of my hands.” How convenient, right? If we choose to believe that our circumstances are not something we have the power to change, then we simply choose to remain the victim, perhaps under the guise of “I will wait idly by for God to save me.” Or we choose to believe God wanted this circumstance for us so we must endure further suffering. Or, we couldn’t possibly change these conditions, it is impossible. What if— we are accountable, it is our fault and God has availed “Himself” to be a co-creator with us in any life circumstance we choose? Uh Oh! Now THAT would be a lot of accountability; which is precisely why many choose not to embrace this premise. All things are possible, hmmm, where have I heard that before? To catapult your life to fulfillment, it starts by believing anything is possible. Not just believing at the surface, “Sure, well I guess so.” It is a belief that must be an undeniable conviction. A KNOWING. An undisputable fact…and if you don’t reach that level of thought, you will not achieve the outcome you desire, and therefore you will have the convenience of saying, see? And then slump back down into helplessness…it is out of my hands. Granted, maybe at first we didn’t know what we were signing up for. Maybe at first it wasn’t our fault in that we were just moving lovingly along, moving forward, and seeing where a relationship or situation was headed. However, when we repeatedly ignore the reality of those circumstances, we remain “asleep,” choosing to endure intolerable suffering and excusing it away under some delusional premise such as “They are doing the best they can.” “They don’t mean to hurt me.” “They want to treat me better.” “There is nothing I can do about it.” “It is completely out of my hands.” Or any plethora of other lies we choose to tell ourselves. It is in those moments we must acknowledge that the responsibility has shifted to us. It is our fault. It is our fault because we are announcing that we are simply helpless to remedy the issues in our lives; and that is a lie. Spiritual, Financial, Emotional, Physical and Mental. And in any of these areas that you choose to believe you are not accountable, then prepare to spiral down in your life. Your helplessness will give credence to the false beliefs you are choosing to accept. And when you do that, be prepared to live the life of a sufferer…when in reality, no matter what has transpired, you have always had the power to change it. Instead, we get too tired, too lazy, too afraid, or just too comfortable “living in the horseradish” as Susan Jeffers refers to it. We get comfortable in the muck, and that is a choice. 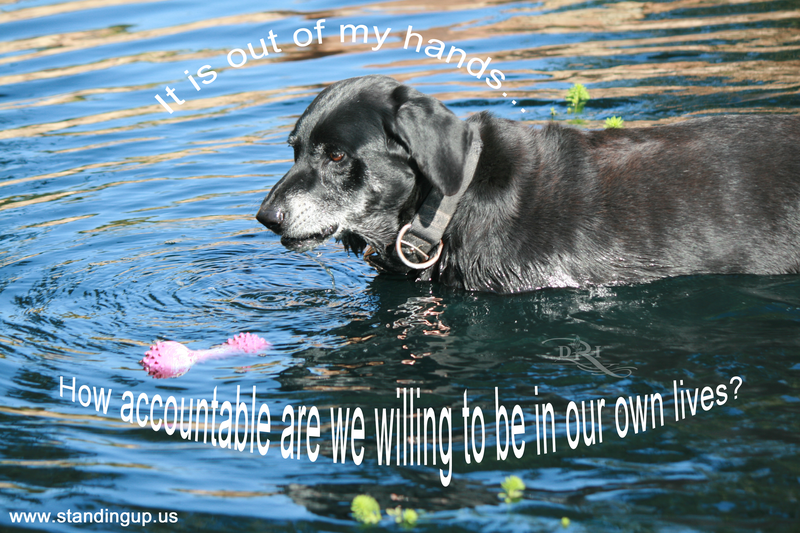 The alternative, would be to accept our accountability for the conditions of our lives, and that feels too damn hard. This is not to say that we should not offer compassion to ourselves for what we have allowed and sustained. It is not to say we should beat ourselves down for our failures. Contrary to that, we should drench ourselves in love and understanding. We need to realize if we truly loved and honored ourselves deeply, we would have taken action sooner…yet, all we can do now, is love ourselves through it. But if we remain with the belief that we are powerless, then our lives will continue in the manner that they always have. Our self-destructive patterns will repeat themselves. We are never truly powerless. We just sometimes have forgotten all that is available within us to allow for a completely abundant life, a joyful life. I was willing to accept the behavior of my abusers. I didn’t fully understand lies, deception, manipulation, or any form of evil. Since I perceived they weren’t in my makeup, I assumed they weren’t in anyone else’s either. I never even looked, not even for a moment, at what was happening to me and being inflicted on me. I was blind to the deception and manipulation because I could only see the good. I would think I saw or felt red flags occasionally. I would experience little inner promptings warning me, but time after time I would choose to ignore these signs. I didn’t understand they were warning me that I was incongruent with my soul; the knowing of what was in my highest, greatest good was always present. Instead, at some unconscious level, I decided if I looked, or perhaps feared if I looked at the message of the red flag, my whole world would come crashing down. During that time I was asleep I never stopped to see that my personal world was already a train wreck; a train wreck that could have been salvaged at any time. It was then, and always will be, our choice. Spiritually: Do you really want to accept that God decides for you? Or do you want to decide God (however you define it) grants you the power to create any life you want? That as promised, all things are possible, if you choose to harness the power that is available to each and every one of us. Financially: Do you really want to go through life with a scarcity mentality or a belief that if you have financial security or abundance that makes you bad? Or the belief that there isn’t enough to go around or that you will never have plenty because somehow you are unworthy? How can you receive abundance of anything if you don’t believe you deserve it? Emotionally: Do you really want to numb yourself to the emotions that exist? If you aren’t willing to feel and experience fully the pain, then you also are not willing to fully feel and experience the joy. One cannot choose to simply feel happy emotions and ignore the rest of them. Numb is numb, whatever you refuse to feel, numbs you and leads to a repressed pile of emotions inside, just waiting to erupt…anxiety begins. Physically: Do you really want to decide you are not responsible for your health? If not you, than who? Do you really want to believe we are punished for mistakes and “cursed” with illness…or do you want to be accountable here as well, and know your body is capable of healing itself? Your body is a living organism…and just like a plant will die if you curse it and mistreat it…your body needs your love. It needs YOU to believe it is alive. Mentally: This one at many levels directs all the others. We all have heard countless expressions that reflect the power of our mind to create our lives. Whether you believe it or not, does not change this fact. Your thoughts have true energetic power, so if you don’t like the conditions of your life, start here, change your mind. Become conscious of your thoughts…and choose ones that will serve you rather than harm you. Choose to no longer be that harsh abusive parent to yourself. Be kind and loving to you. You are the powerful creator of your life. If you don’t like what you see, begin to draw another image. Don’t be a victim. It is a choice. Move from Fear and Control to Love and Freedom. « What Do a Butterfly and a Nacissist have in Common? Where in NY? That is where I live ;)! And thank you for sharing my blog!